I'd like to share a few words about scoring. I think you know by now that I strongly encourage everyone to shoot a proper round and whatever the score is, to submit it to our Records Officer, Giles Conn. Think of it as an annual competition (a) to wear him out, and (b) to see if we can altogether, beat last year's tally. 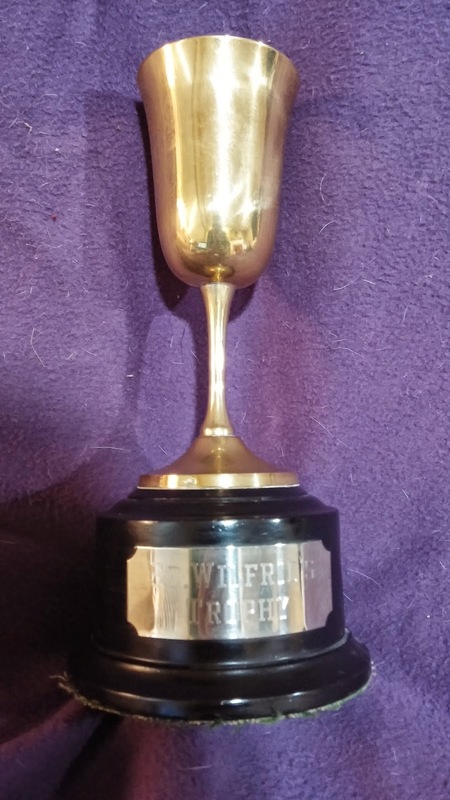 Also, for the outdoor season rounds, you can have a go at achieving the St Wilfred trophy. I've won it 3 years running (last year jointly with Terry Skinner), but they wouldn't let me keep it this time, sadly. Here's what I don't do - put my scores in directly at the target face. That's something which is strongly discouraged by GNAS and I believe it is banned in the big official shoots. I'm not sure if they don't like them used because it's too techy for them, but I don't, simply because I don't want to lose my score if my phone dies on me. I also like to keep my brain exercised by scoring manually on a proper score pad; I then check I've got it right by entering it all onto my mobile or tablet. incorrect arrow score which has been altered would need the counter signatory to initial the change too. I could give myself some amazing scores if all I used was my App! Imagine how gutted you will feel should you discover you have achieved a county club or open record but can't submit it because you haven't scored it in the right way! And think ahead to when our mobile phones and all technology is zapped by Gort (The Day the Earth Stood Still); you'll be so glad I warned you. Having said that, Archery Score pad lets me save all my scores to my Drop Box account, which means that I can pop the latest score down onto whichever gadget I like. What's more when I change phones - which I do frequently - I'm not going to lose anything. Don't you just love my belt-and-braces approach? It also lets me plot my scores in graph format and do all sorts of clever stuff. You will need to purchase it (as I already have can'see how much it is right now), but download a couple of others to try first. If you come to Seahaven indoors, pop your score onto the target chart, as one of us always gets that to Giles afterwards (but if you forget, you need to submit it yourself). strong winds, by the way. Not like us barebows and longbows who can shoot in just about anything. into the equation. So, how is your technique? a time until you achieve some consistency, then tweak something else. will score me 54 – so why can’t I do that every time? already. Don’t shy away from asking a coach to help either. One last thing. 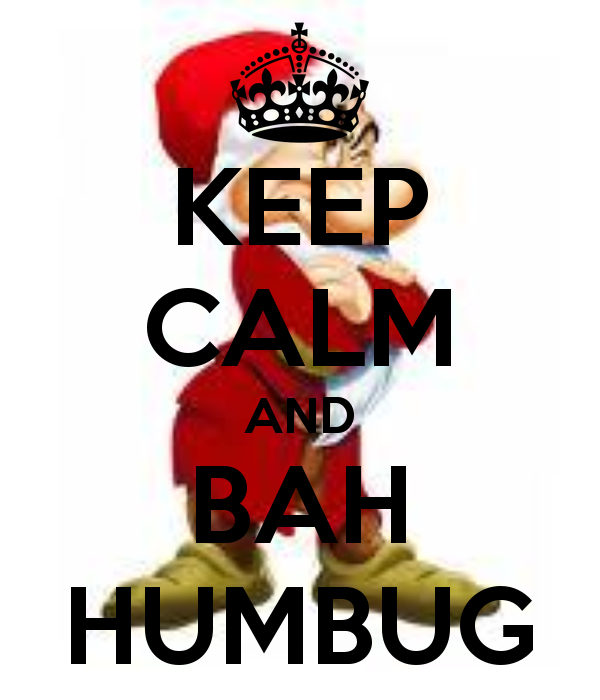 Even though I am strongly committed to the ‘Bah-Humbug’ Brigade, I love our Christmas Fun Shoot. Everyone wins something and we have a lot of laughs, make a lot of noise and let the banter fly. Do be sure to come along and join in the fun. The more the merrier - and you don’t have to dress up as Santa unless you really want to. Do let me know if there is anything in particular you would like me to write about either here for NAC Today or on the blog. Here to help. Are you ready? We start shooting indoors from the 1st October and what fun we will have! Are you ready for it? I like shooting outdoors. I like shooting indoors too. Both are the same - but different. Outdoors is lovely being in the fresh air after a long day stuck in the office. A good breeze always seems to help my score and it's relaxing to be with good company, no particular time restraints, me, my bow and my arrows (and sometimes a long hunt for buried arrows several times during the evening!). Indoors - remove all the words either side of 'me, my bow and my arrows'. We shoot at Seahaven Academy (used to be Tideway School) on a Friday evening and alternate Sunday afternoons, with Juniors having their Wednesday evening too (adult shooters not allowed). The round we usually shoot is a 'Portsmouth' which is 60 arrows at 20 yards on a 60cm face (10 zone scoring). 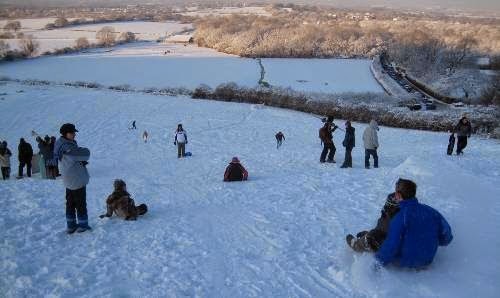 This is mainly because we take part in postal matches - rather like the Selby which we do every month outdoors. You can shoot shorter rounds, but not longer as we are restrained by the length of the hall. Every now and then we have a different kind of shoot - a Vegas, Worcester , Bray and the Christmas Fun shoot. Look at all those smiles - and it's indoors! If there's time (and there usually is as long as at least 4 other people are staying on) you can shoot the same round again to do a 'double' eg double Portsmouth. · It's important to turn up a bit early especially to help with setting up. The main door will be locked when we start shooting. 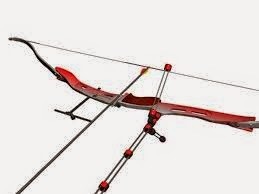 · It's a bit cramped for setting up your bow as we all need to fit along the corridor. There's plenty of room for all, but be aware of other people's space and equipment. We usually end up in the same spot every week - more by habit than necessity! · There are two faces per target boss and 8 bosses. Still plenty of room, but you won't be able to 'side-load' your arrows. · Depending how many people turn up, we may need to shoot in two details. The first detail leaves their arrows on the target and exits the hall as the the second details comes in to shoot. All arrows are collected at the same time. · Shooting procedure is controlled in a timely fashion by the Field Captain (whistle or voice). · There is much less banter on the line. I'm not sure if that's such a good thing though. Remember the Olympics - all the cheering and applause? I liked that. Nevertheless, a quiet shooting line is appreciated by lots of archers. · There is a metre or so at the back of the hall where you can stand your bow, and some of us need a chair. · At least the arrows are easy to find should you miss the target. · At the end of the session (and we must be out by 9pm) everyone helps to put everything away before dealing with their own equipment. There is no need to rush - always plenty of time for all. Think of indoor shooting as a great way to perfect your style. There's no wind and the target will nearly always be the same distance away. And if you really want to, there are still the away competitions you can apply to take part in. The first time I shot indoors I couldn't believe how many members turned up. We frequently needed two details, so it does surprise me when sometimes there aren't very many people who come along. Perhaps it is because it starts a bit later, so they can't go straight from work; it's dark and miserable outside - but hey - we're not shooting outside. There's a big car park, so you have no excuse and just ask if you could to with a lift from someone! I'm really looking forward to it - so do come along and join us. Summer is really upon us now and I hope you are all having fun and taking part in lots of archery competitions. For thoseof you who have only recently joined our club, do come along and participate in some of our club matches - they are avery good way to learn how it works shooting at a more formal type of event. You don't have to do the longer distances. Lots of people come along to shoot 30 yards/20 yards just for the experience. Even going to other clubs, while it may seem rather daunting at first, you will always be welcome and I have only ever come across fellow archers who are friendly and enjoy a bit if banter (off the line of course!). That's something I often hear about our club. How friendly everyone is. The banter we often share; the laughs too. 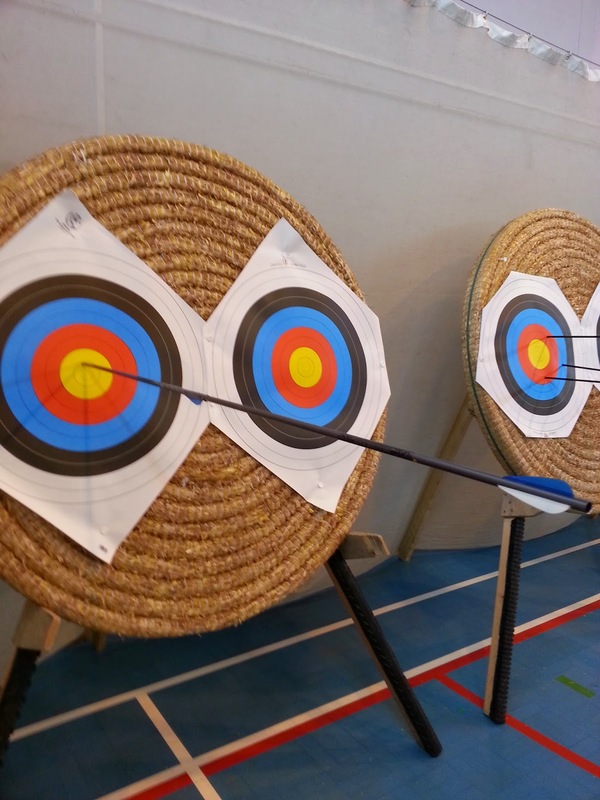 Archery needs to be serious because bows and arrows can be dangerous things, but it can also be great fun and a great personal challenge too. Four years ago, when I started, I couldn't even dream of shooting 50 yards, let alone the 80s and 100sI do now. Do check the calendar for upcoming club events and matches. ( Page 2) If you are new, you may not be able to help out at the Firle Horse Trials Have-A-go, but you can give support to those of us who are able to be on the line, at the same time you will remember your first try. (31 st August Firle Place) There's lots of other stuff going on well worth a visit. Likewise, if you want to see how a big competition is run, look out for the area events and come along just to watch. They really aren't as frightening as they sound. So, you've passed the beginners course - wasn't it fun! Now you're going to start your real archery training! There's still lots to learn, so don't be afraid to ask for help if you get stuck. Just bear in mind though, that your new archer friends are more than likely shooting a full round, so they may not be available straightaway as they will want to finish that first. Also, club rules are that no-one should approach you to offer help (unless it's obvious you are doing something a bit dangerous). You have every right to let them know that you prefer to see if you can work it out for yourself first - so do! So, why are we shooting rounds anyway? There are several reasons. For me, it's to achieve something each session. I can play afterwards. I shoot a round because it's a good way to monitor how well I am doing. We all have off days and weeks, even months, but how are we going to know how well we are really doing unless we have some means of monitoring our progress? Once you have sent in a few scores you will be given your 'handicap' (you will need to pester Simon for it, but he's the man who works them out). Did you know that the person who makes the biggest handicap improvement in a year wins the coveted 'Improvers Medal' which will be presented at the club's Annual General Meeting. If you don't keep score you will never get a handicap, and never really know how well you are doing or how well your skill with the bow is developing. I discuss all this in a bit more detail on my blog. It's a personal challenge. But it does mean that you can enjoy shooting at other competitions near and far and hopefully win lots of medals too. A quick introduction: I am no spring chicken, but they won't let me have a bus pass just yet (they changed the rules!). I started archery in 2010 with NAC and haven't looked back since. Love it. 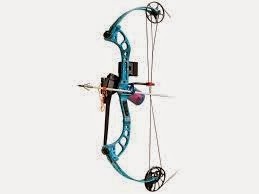 My biggest decision however, was in going to BareBow from Recurve during my first indoor season. I was really struggling with those darn sights and feeling very discouraged, when Terry (The Skinner) said, "Why not try barebow - we need barebow archers?" Jane, (also The Skinner) wasn't able to do much shooting at the time, and she took me under her wing and really got me going - she should have been a coach. 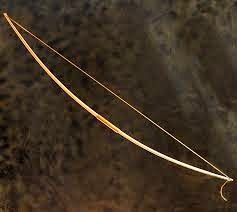 So, what I'm saying is that you don't have to stick with a particular bowstyle if you don't want to, and just because we start our training with barebow and then move on to recurve, doesn't mean you can't switch back or try compound or longbow. Now, when I say change back, changing your bow style is not downgrading or upgrading. You need to shoot the style which suits you. Many archers shoot more than one, even all of the styles I've mentioned (but not all at the same time, I hasten to add) - whereas some, like myself, prefer to keep to the one bow style and upgrade our equipment instead. Have a chat with other archers and ask them why they choose to shoot what they do. Some may even let you have a go with their bows too. Each style has advantages and disadvantages - and each has its own scoring goals for achievements too. If you're not satisfied with your shooting performance using your current set up, don't be discouraged, but instead think if changing your bow style may be the way to go. 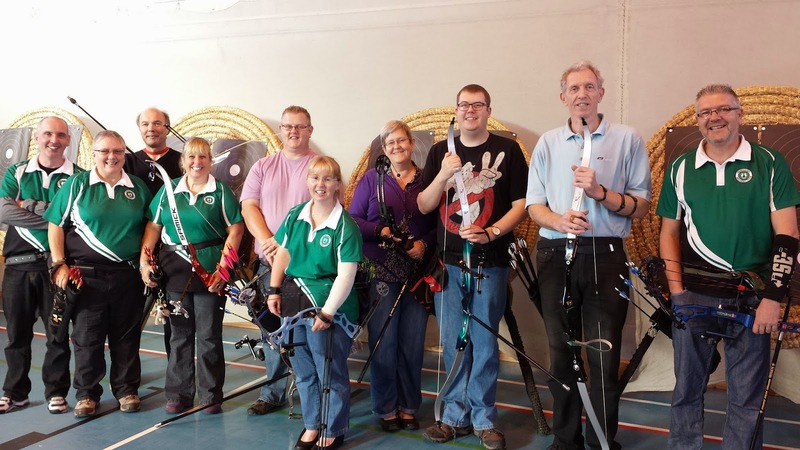 Our fantastic club coaches and more experienced archers are always here to help.